Heat oven to 450°F. Unroll 1 pie crust on work surface. Roll lightly with rolling pin. With 2 1/2- to 2 3/4-inch round cutter, cut 12 rounds from crust. Press rounds in bottoms and up sides of 12 mini muffin cups, with edges extending above cups about 1/8 inch. Repeat with remaining pie crust. Place about 5 of the chocolate chips in each crust. Bake 6 minutes. Leave crusts in pan. Reduce oven temperature to 375°F. Meanwhile, in medium bowl, beat cream cheese, brown sugar, caramel topping and egg with electric mixer on medium speed until creamy. Spoon evenly over chocolate chips, about 1 1/2 teaspoons for each tartlet. Bake at 375°F 10 to 12 minutes or until cheesecake is set. Cool in pan on cooling rack 10 minutes; remove from pan. In small microwavable bowl, place remaining chocolate chips and the oil. Microwave uncovered on High 30 seconds; stir. Microwave about 30 seconds longer or until melted; stir. 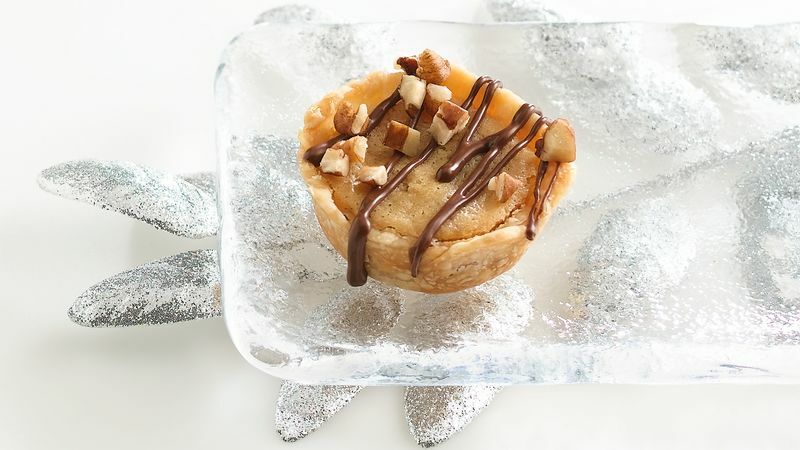 Drizzle over each tartlet; immediately sprinkle with pecans. Refrigerate at least 2 hours before serving. Cover and refrigerate any remaining tartlets. If you prefer your chocolate less sweet, use semisweet chocolate chips instead of the milk chocolate.